Diamond Archery offers some of the most respected bowhunting technology, bows, and gear in the business. Their dedication to high quality craftsmanship and customer service is what brings satisfied customers back again and again. Diamond Archery needed to revamp their online presence with a responsive and modern website their customers could navigate and enjoy. We created a website that exceeded their expectations. It’s a place where loyal customers can research bows and engage with a worldwide community. When a visitor lands on Diamond Archery’s website, they see sharp and modern graphics matched with a clean design. They’re able to compare bows and research technologies in an engaging and colorful website that stands out against the competition. Diamond Archery offers a superior product to it’s customers, so it was vital that the website have clean lines and a sophistication that illustrates that fact. Everything from the smooth animations to the large colorful images demonstrates keen ability and technological superiority. Sleek applications dominate the user experience on Diamond Archery’s website. The Bowfinder Quiz guides customers to the correct bow for their needs and the comparison charts allow curious visitors to engage with the specifications. The online experience for visitors to the website is smooth, but the content management system we developed for the Diamond Archery staff. Updating staff photos, create news blog posts, and item descriptions is easy and makes a technologically advanced website seem elementary. These days, the sport of bowhunting and archery are popular across the world. The best way to engage this community is through social media, so Diamond Archery goes the extra mile by bringing them together. 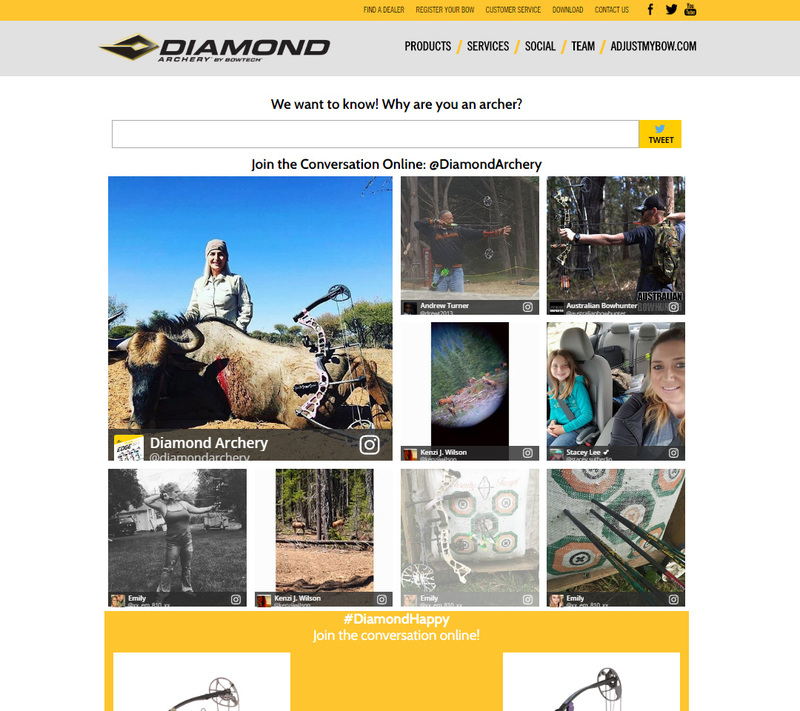 Each bow the Diamond Archery offers has it’s own social media hashtag, allowing loyal archers across the country to see their photos featured directly on the website. A Video Room offers visitors an impressive display of relevant YouTube videos that captures the popularity of video and the social sharing experience.